Katie Gray has been promoted to a recreation position and will no longer be involved with park maintenance. You’re Invited to a Habitat Restoration / Maintenance Work party! 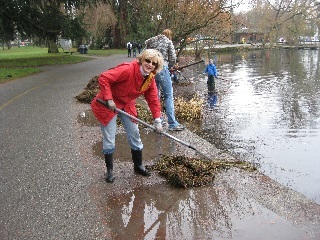 Come help get rid of Blackberry and maybe some English Ivy from shoreline habitat area at our most popular Green Lake. Give native shrubs along the shoreline a chance to grow and thrive. Meet along path near intersection of N 64th St. and E. Green Lake Way Saturday, June 7, 2014 – 9 am to 12 noon. Work area for the morning will be along the east shoreline extending south from the fishing dock across from the intersection of N. 64th Street and E Green Lake Way. There is a stop light controlling the intersection at this location. A Friends of Green Lake Banner will be hanging along the path to mark the work area. Volunteers will remove as much of the above ground growth of the blackberry and ivy as can be accomplished. Be sure to dress for possible wet weather, and long sleeves to protect against blackberry thorns. Please no open toed shoes. Because this is the day of Seattle Works, please bring your own tools and gloves to work with and maybe an extra to share. Contact Maureen Kwolek at Friends of Green Lake, mokwolek@comcast.net/206-919-6630 or Garet Munger, garetpeter@comcast.net, if you have questions, and especially to indicate you wish to join in. Seattle Works Milfoil Removal Project! A group of employees from Herrera will be volunteering their expertise and diving skills to remove invasive milfoil from the lake’s bottom sediments on Saturday morning June 7. Yes! They will be in the water with scuba gear and wet suits, and manually pull milfoil out by the roots, then bring it to the shore for pickup by the Seattle Park Dept. Seattle Works Day comes once a year, with employees from local companies volunteering their Saturday morning to help non-profits or to work in the parks and schools. Usually volunteers remove blackberries and other invasive plants on land, but this year, at the suggestion of Friends of Green Lake, Herrera employees will be literally diving into Green Lake to remove the milfoil weed from the bay just north of the Green Lake Community Center. Photos courtesy of Mickey and Karen Schurr. Shoreline Work Party Saturday May 17 at West Green Lake Site – Volunteers Needed! You’re Invited! Friends of Green Lake is sponsoring a Shoreline Habitat Restoration Work Party Saturday – Meet at Beach Side, Bathhouse Theater, West Side of Lake on Saturday, May 17, 2014 – 9 am to 12 noon. Come help get rid of Blackberry, English Ivy and other invasive plants from shoreline habitat. FOGL plans to remove blackberry and ivy where it is beginning to become established along the shoreline. The ivy has begun crawling up and into trees along the shoreline. We will remove as much of the above ground growth of blackberry and ivy and any other invasive, non native plants as we can. Work area will be along the shoreline south of the West Swimming Beach, approximately between the beach and the fishing dock, on the west side of the lake adjacent to Bathhouse Theater. Parking is available in the Bathhouse theater parking lot, and nearby on the street adjacent to the work area. Friends of Green Lake Banner will be hanging to mark the work area along the path. The park department will provide us a collection of tools and gloves for our use. If you have a favorite tool and your own gloves for attacking blackberry and ivy, please bring them along. Be sure to dress for possible wet weather, and long sleeves to protect against blackberry thorns. Please no open toed shoes. Contact Maureen Kwolek at Friends of Green Lake at mokwolek@comcast.net or 206-919-6630 if you have questions, and especially to indicate you wish to join in. Hope to see you this Saturday, May 17!!! Friends of Green Lake is an association of volunteers whose mission is “to ensure a healthy lake for wildlife and recreation”. FOGL only exists because of volunteers. FOGL has IRS approved tax-exempt status for environmental, scientific and educational activities.